"Lyons Welcome of the Year"
Our double, family and twin bedrooms are all ensuite with complimentary toiletries, TV, tea/coffee making facilities, hairdryers and tourist information folders. Start the day with a good quality breakfast. Rocksberry B&B offers an extensive Breakfast Menu catering for all tastes. A packed lunch is also available for those taking to the waters for the day. Angling facilities are available with boats for hire on local lakes. Lake tours can also be arranged. There is also a comfortable guests' lounge to relax in after a long days fishing or sight-seeing. Full size pool table & dart board in games room - no charge. Laundry facilities available at low cost. Wifi access available - no charge. Double/Twin room euro32 to euro35 per person sharing. 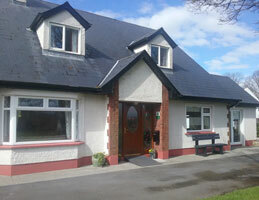 Single occumpancy euro40 to euro45 per person. 25% Discount for children under 12 years (sharing with adult) Children under 2 years are Free. Originally a market town Castlebar has kept this tradition and is renowned for it's variety of interesting shopping areas. There is plenty of nighttime entertainment including traditional Irish music, discos, theatre and top quality dining at a wide range of restaurants. Castlebar is a superb location for outdoor pursuits including planned walking routes and is surrounded by some of the best fishing lakes and rivers in the West of Ireland. There are three championship golf courses, numerous horse riding centres and an adventure centre for water sports and rock climbing, all within a 30 minute drive. Other activities on offer include cycling, karting, bowling, swimming, tennis, sailing, sea angling and heritage walks. Castlebar is centrally located in an area rich in heritage, history, scenery and tradition and is the perfect base from which to explore one of the few unspoiled areas of Western Europe. Croagh Patrick, "Ireland's Holy Mountain"
Museums: (Michael Davitt, Kiltimagh, Museum of Country Life). Clew Bay with its beaches and islands. Bernadette & John Walsh look forward to meeting you.